Layer is an open communications layer for the Internet, a platform that enables app creators everywhere to easily add native communications to their products. Whether an app is centered around compelling content in sports, entertainment or news — or the focus is finding and buying a concert ticket or a t-shirt, booking a flight or hotel, or hailing a town car or taxi — enabling users to engage with one another in-app and in context is the key to a delightful user experience. 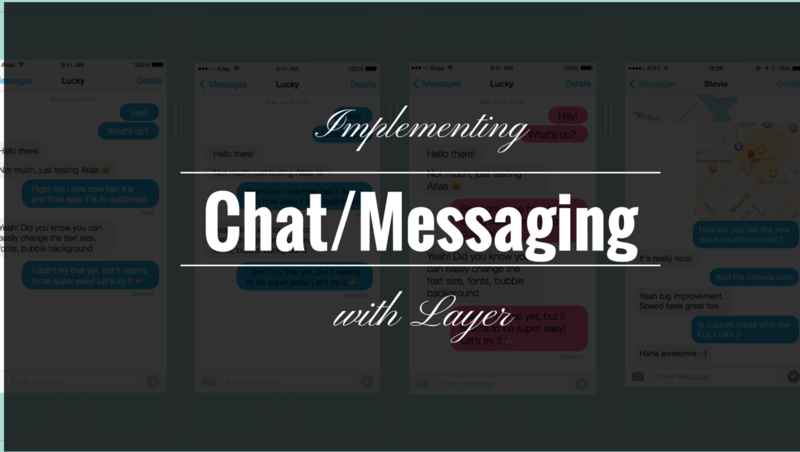 Layer is one of the easiest ways to integrate chat and messsaging features in your apps. With the recent launch of Atlas, it is even easier to integrate Layer in your app using its fully featured, high performance, 100% customizable UI kit. This tutorial explains how to quickly get started with Layer and Atlas to create a simple app to chat between a device and a simulator. // For the purposes of this Quick Start project, let's authenticate as a user named 'Device/Simulator'. // Once connected, authenticate user. Once connected, it is time to authenticate the LYRClient object. Layer authentication requires that a backend server generate an Identity Token on behalf of the client. For testing purposes, Layer provides a sample backend that takes care of this. // Check to see if the layerClient is already authenticated. // If the layerClient is authenticated with the requested userID, complete the authentication process. //If the authenticated userID is different, then deauthenticate the current client and re-authenticate with the new userID. // If the layerClient isn't already authenticated, then authenticate. The following code snippet connects to the sample Layer Identity Service, generates an Identity Token on behalf your application, and authenticates the LYRClient. Note that in production apps, you would need to update it to communicate with your backend and generate a token for Layer. Please check out the Layer Authentication Guide for setting up your backend for this. NSLocalizedRecoverySuggestionErrorKey: @"There may be a problem with your APPID." A participant is a user that participates in a conversation. It contains information for Atlas to render the details about the user when displaying conversations. Create a class PGUser that implements the ATLParticipant and ATLAvatarItem protocols. For the simple example, it uses the participant identifier as all properties of the users, but you will need to modify it to fetch these properties from your API based on the participant identifier. The user is now authenticated to Layer. Let's grab and show all conversations the user is currently involved in. Create a subclass PGConversationListViewController of ATLConversationListViewController. Now that we have all the conversations the user is involved in, let's see how we can show all messages inside a single conversation. Create a subclass PGConversationViewController of ATLConversationViewController. That's all you need to integrate a chat in your application. Need help setting this up or just want to chat? Shoot me an email at [email protected].